At 58, Shafath Ali Khan is an adviser to five states - Bihar, Jharkhand, MP, Karnataka and HP. In fact, the very Hyderabadi marksman she was referring to is at present enjoying a vacation with his family in Ooty. At 58, Nawab Shafath Ali Khan is an adviser to five State governments. “As a person well versed with forests, I give classes to IFS officers. I am also authorised to tranquillise wild animals,” says Khan, adding he does not charge anything for his services that include culling man-eaters and rogue elephants. 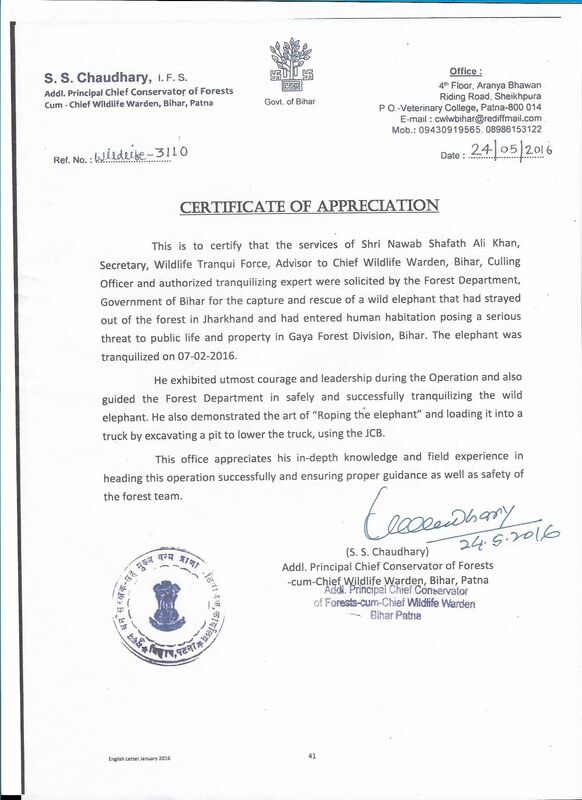 Khan is part of an NGO called Wildlife Tranqui Force (WTF), headed by Hitesh Malhotra, a retired IFS officer. “As a person well versed with forests, I give classes to IFS officers. I am also authorised to tranquillise wild animals,” says Khan, adding he does not charge anything for his services that include culling man-eaters and rogue elephants. Speaking to Express, Khan says that he first shot a rogue elephant when he was 19, in Mysuru, and on invitation of the Karnataka government. About three generations of Khan’s family have been into, what he calls, wildlife conservation. His grandfather Nawab Sultan Ali Khan Bahadur was an adviser to the British government on man-animal conflict for about two decades. Wherever wild elephants caused trouble, he would be given orders by the government to shoot them down. In fact, Bahadur, who has has killed more than 50 rogue animals, was given the title of ‘honorary elephant hunter’. When it came to the second generation, government requested Sultan’s son Nawab Arshad Ali Khan to kill rogue wild animals. He has culled seven rogue elephants in his lifetime. The story did not end there. The legacy continued with Shafath Ali becoming the next sought after shooter. “We belong to the noble royal family of Hyderabad. Errum Manzil palace was my grandfather’s residence. Shikaar was a tradition in all royal families. In fact, tigers and forests were better protected under our rule,” says Khan. “Farmers in Bihar have been suffering from terrorising blue bulls for the last two decades. These animals are not endangered. About 25,000 blue bulls can be outside forests in various agriculture lands. If 200 nilgais come into a farm, it will ruin the crops in one night. How could you expect a farmer to survive?” he adds. 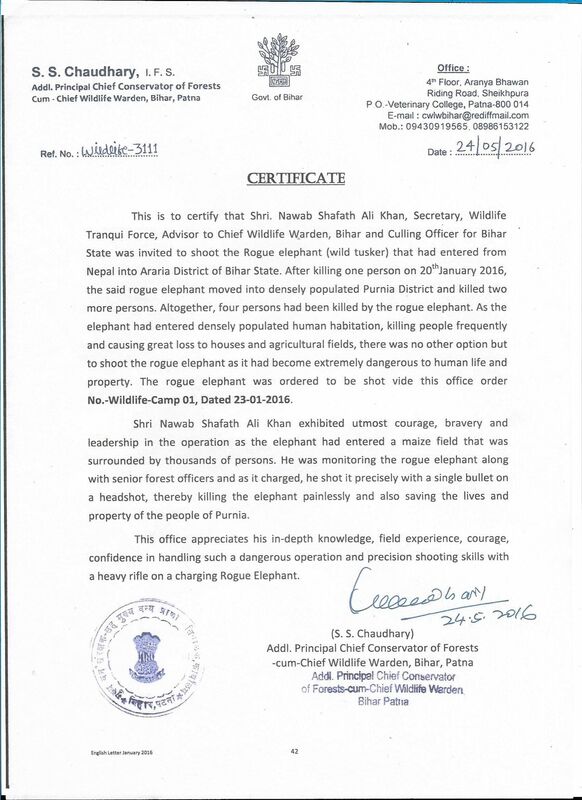 Nawab Shafath Ali Khan is the only authorised culling officer in the country. He has culled seven elephants, three tigers and nine leopards and holds the world record for culling 15,200 feral pigs (a cross breed of wild boars and domestic pigs) in Shivpuri in Madhya Pradesh following an order from the HC. The senior most target shooter in india has also won gold medal at the National Games when he was 12-year-old. In 2013, two male man-eater leopards killed 19 children in Thunag village of Himachal Pradesh. “There were 19 leopards in the forest. I identified the two man-eaters and killed them. From September 2013 till now not a single person has been killed by a wild animal in that village, which means I killed the right leopards,” he claims. Earlier this year in January, Khan was taken from Patna to Purnia in CM’s special aircraft to shoot and kill a rogue elephant that killed five persons. In February 2016, he tranquillised a rogue elephant in Bihar. It has now become the pride of Patna zoo.